Jump Paris is a cool and exciting luggage solution company that has been making exciting moves in the market for 30 years. They are known for breaking traditional luggage codes and making dynamic creations to try and escape the solely practical purpose of our standard black suitcase. I recently purchased this gorgeous soft leather feel suitcase, from Jump Paris (learn more here!). The beautiful deep chocolate brown just screamed my name! With a variety of colours to choose from within the Uppsala collection, the classic brown just oozed sophistication and style, without being too out there! The outer material is poly suede coated on polyester, which means the case is super soft and ultimately lightweight thanks to the poly suede. Also doesn’t get dirty easily and is super easy to clean, unlike real suede! The top and side handles of case are made from beautifully soft full grain calf skin. 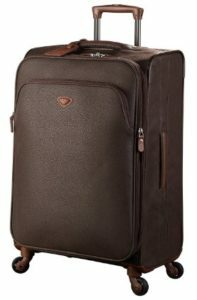 Its just so soft and smooth, theres no denying that this is an incredible classy suitcase. You can be assured by the quality of the material that this really is a high quality product. I love the deep brown and the contrasting lighter brown handles. 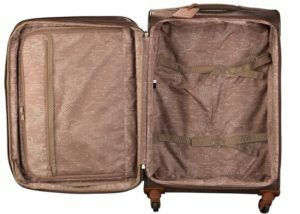 The material makes this suitcase super lightweight, weighing in at only 3.6kg, this is an amazingly light suitcase given the size, which is a nice Height of 67cm, Width of 43 cm and Depth of 29cm. No more lugging around unnecessary weight from your case, or having to compromise on what you can pack because of weight restrictions. It also has a zipping expanding compartment, which expands by 2 inches, so you don’t have to worry about having space for the holiday shopping we all love to do! You can go mad on souvenirs for all your friends and family! The four 360 degree spinning wheels make for excellent transportation. Four wheels are a must have on any suitcase for me, I don’t know how I ever got by with two! The wheels glide so smoothly, no more rattling, squeaky wheels. The manoeuvrability on this suitcase is excellent, it really moves with you and feels amazing in my hand. The telescopic handle also is so practical and smooth. What I love about this case is the attention to detail. The main closure is zipped with double sliders so your belongings are super duper secure inside, and it comes with a TSA approved padlock. The lining is fully lined with a gorgeous silky material, with a beautiful map print inside, which just gives this case such a polished and smart look. The interior features packing straps, so you can pack in and organise everything perfectly. It also has two interior zipped pockets, for those little bits you don’t want floating around the rest of the suitcase, perfect for jewellery, valuables, and anything else! Finally, a large zipped pocket on the from exterior of the suitcase is perfect for those things you need to keep at hand while you travel for example laptop, or travel documents! With a capacity of 66 litres this is an incredibly spacious suitcase, which is also impressive when you put it against the weight of this lightweight case. This suitcase could easily take you on a 2 week trip, and with the expanding feature I would say this suitcase could actually cater to all needs. For me this suitcase is the perfect travel companion. It oozes class and sophistication. The soft leather look and classy design is something special. Its a luxurious medium sized case, which is just really great for so many occasions. I can’t really fault this case! Down to the lovely details of the leather tag holder and the very soft, calf skin handles, I love travelling with this. It’s actually made me re-think packing, I can’t wait to do what is usually the chore of packing for my holidays! It has now withstood man thousands of air miles, sea miles and road miles! And is withstanding the test of time. I’m so happy with this suitcase, I will definitely be buying the set. There are other colours and sizes available in the Uppsala range, and I know I’ll be completing my set with a nifty little carry on case from this range. I’m so pleased with how functional this suitcase has been and feel that its been worth every penny!